Check out a disc coming out next week from Vinyl Republik. The label is based in Winnipeg and has put out discs by artists such as Sinewave, Pete Samples, and Lampshade. Up next, a compilation called ‘Fear Of A Digital Planet’. You can stream the record here. Definitely a good cross-section of interesting electronic music. To support the record, a series of tour dates have been booked, check below for more details.? 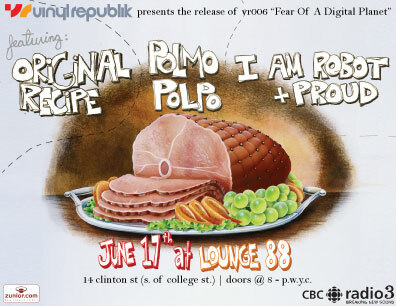 I’m stoked for the Toronto one, June 17th at Lounge 88 (you get a copy of this disc if you pay $10 at the door).